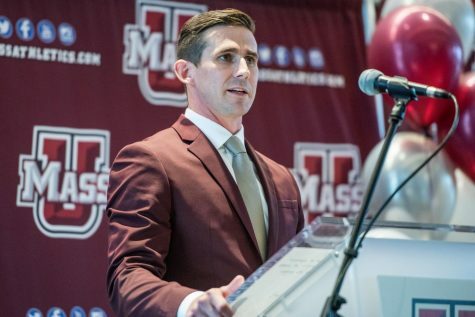 The Massachusetts football team made its mark Wednesday night, but may have suffered a significant setback in the process. 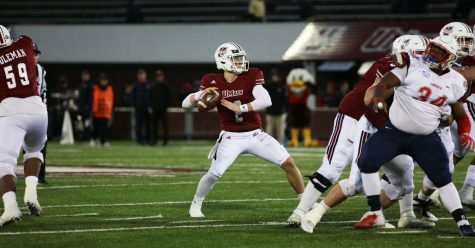 UMass knocked off Ball State 24-10 in a game that lacked the typical offensive prowess the Minutemen have produced on a weekly basis throughout the year. 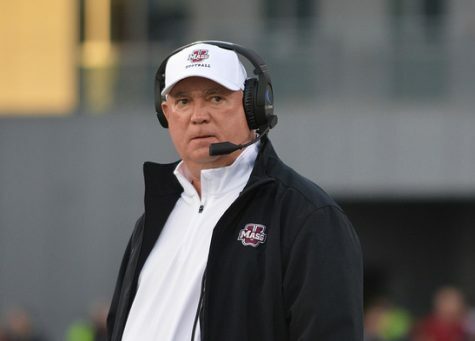 But UMass took an even larger hit in the fourth quarter when quarterback Blake Frohnapfel limped off the field following a third down scramble. “I don’t think it’s good, but I don’t know for sure,” Minutemen coach Mark Whipple said. Frohnapfel was seen in obvious pain and on crutches on the sideline and was then loaded onto the back of a cart and transported off the field where trainers and medical personnel examined his right leg. Backup Austin Whipple entered as his replacement, and Mark Whipple said Austin would start if Frohnapfel cannot play moving forward. 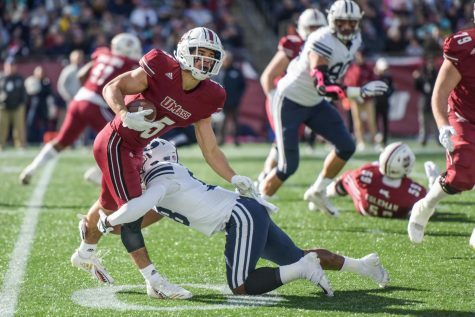 Frohnapfel’s injury overshadowed a UMass victory highlighted by an impressive defensive performance and individual presentation from receiver Tajae Sharpe. 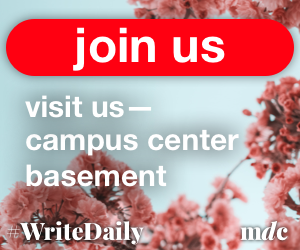 The Minutemen held the Cardinals to 282 total yards while standout Ball State running back Jahwan Edwards rushed for only 36 yards on 18 carries. The Cardinals scored just three points in the second half. 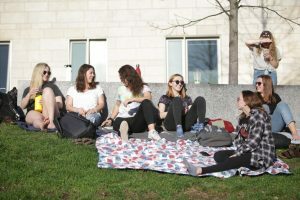 “I think it bodes well for the future here that the defense stepped up today and played well against a pretty good team,” Whipple said. UMass linebacker Trey Seals especially stood out. 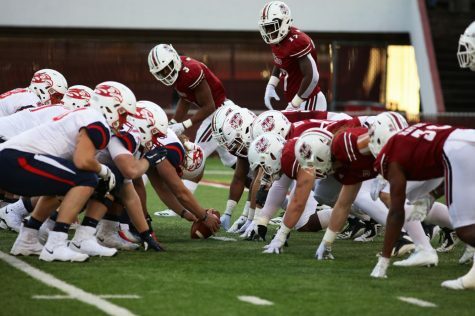 The junior forced a fumble, recovered a fumble, added a sack and intercepted Ball State’s quarterback Jack Milas in the fourth quarter as the Minutemen clung to a 17-10 lead. 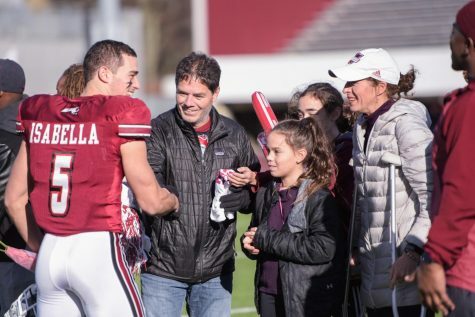 UMass answered on the ensuing drive following Seals’ interception, when wide receiver Elgin Long scampered into the endzone for a 7-yard rushing touchdown out of a “Wildcat” package to make it 24-10. Sharpe was Frohnapfel’s go-to target throughout the game, finishing with 13 catches for 239 yards, including a 61-yard reception. 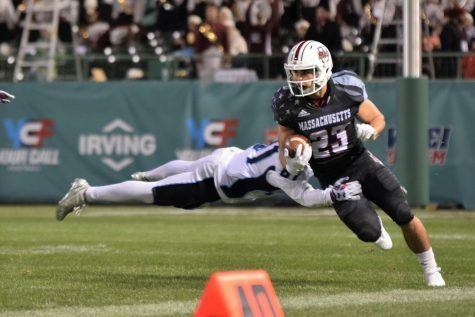 The performance gave Sharpe the fourth-most receiving yards in Minutemen history, passing Victor Cruz. The game opened at a breakneck pace. UMass received the opening kickoff and needed just 62 seconds and three plays to score the opening touchdown. Frohnapfel found Sharpe on the second play from scrimmage on a 61-yard pass, setting up a 3-yard touchdown run by Shadrach Abrokwah on the ensuing play. But Ball State responded quickly. Milas was perfect on the Cardinals’ first drive, completing six straight passes for 63 yards, capped off by a 33-yard touchdown pass to Jordan Williams. It was 7-7 less than five minutes into the game. From there, both offenses sputtered, committing multiple drive-killing penalties in a fairly sloppy first half. 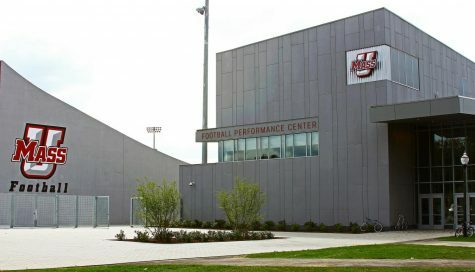 Neither team scored again until the 9:06 mark in the second quarter, when Minutemen running back Lorenzo Woodley scored on a 1-yard touchdown run. The score was set up by a 50-yard pass from Frohnapfel to Marken Michel on the play before. UMass’ Logan Laurent chipped in a 24-yard field goal as the first half expired to give the Minutemen a 17-7 lead entering halftime. Frohnapfel threw a pair of interceptions in the first half. His first came on UMass’ third drive of the game. 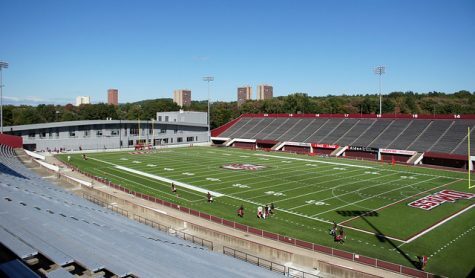 After maneuvering the Minutemen into the red zone, Frohnapfel was intercepted by Ball State safety Dedrick Cromartie on a pass intended for Sharpe who was running a crossing pattern. It appeared the Cardinals would capitalize on the turnover, until Milas fumbled a snap at the Minutemen’s 12-yard line, which was recovered by Seals. Frohnapfel completed 28-of-44 passes for 424 yards and two interceptions.